The Moe Golf Club was created on 3rd May 1934. The first Course had only 3 Holes, and was known as “SAVIGE’S PADDOCK”. Golf was played there for 3 years! Mr Tom Drew ~ President 1936 – 1952. Mr. Tom Drew became President in 1936 and led the Club till 1952. During that time a 9 hole course with “Sand-scrape Greens” was established within the confines of the Moe Racecourse. Town of Moe and surrounding area began to grow and so did the Club. In 1955 it had 70 male and 25 female members. In 1962 under the Presidency of Bob Dunkley, negotiations began with the State Electricity Commission to purchase the present site. Finally, 111 acres were purchased at a cost of $21,000. Next was the BIG project! Build a New Course. An enormous effort, mostly by volunteers, with a good result. Golf was played on the “Bottom” nine holes, in 1965. The “Top” 9 holes were ready in 1966. Mr. Bill Schulz, the General Manager of the S.E.C. officially opened the course in 1967. In 1977 the Club obtained a full liquor licence, this helped in providing amenities during the 80’s for its 600 members. At that time having a large membership, we need a bigger Club House. We build a new one, above the existing, not closing the bar or stopping play! Walls and roof are up. Demolish most of the old, complete this enormous project. The Club must lay a new town-water pipe from Thompson’s Road. (Fire Services). New carpets, furniture, heating and cooling systems. Countless small items. 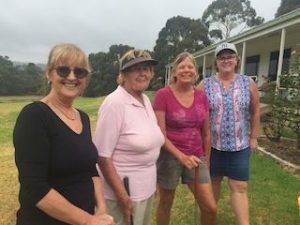 With a nice Club House and a modern Kitchen with good cutlery and utensils, another group of Volunteers, mainly our Women members make thousands of Dollars for the Club by catering for functions and popular Friday Meals. We have money to buy 8 acres of land adjacent to Narracan Lake. We manage to install manually operated Pop-Up sprinklers on Greens. Machinery has to be constantly updated, repairs are costly. Club will need more water for the course, we bulldoze trees and scrub in the gully, We dig a dam and build an earth wall. Add two steel bridges and a spillway. Our Fairways are poor, following other Clubs we try planting “Santa Ana” couch grass on of the 17th Hole. Decision to take up VGA recommendation to sprig by using the “Legend” variety. Success, starting on the 18th fairway. Our Ladies, with their “Special Effort” permit us to improve the drinking water system on the course and to the works sheds. We have a group of our Volunteers tackles another projects: Obtain grants to Bitumen path to 1st and 10th Tees. The work does not stop, they replace the two old “Army” bridges with large pipes. One is completed, second more sweat. We are lucky to have some members that will take the “the bull by the horn”. They win a large Government grant, which by laying cables underground and connecting Electronic valves at each green to a computerized panel. Savings in water use are already proving its value. We embark on Couch planting around Greens on “bottom nine”. Slow progress, cold weather. We will get there! Another very small group of volunteers builds a small garage and the Club arranges to have Motorized Golf Carts for hire.